I will use the font shown on the example license plates, it's the exact same font on every plate shown on the listing image!!! NOTE: names will be cut the exact way they are left in the note, if you send your name in ALL CAPS it will be printed in ALL CAPS, if you send your name in all lower case it will be printed in all lower case, so be specific how you type your name to assure you get it exactly how you specify. 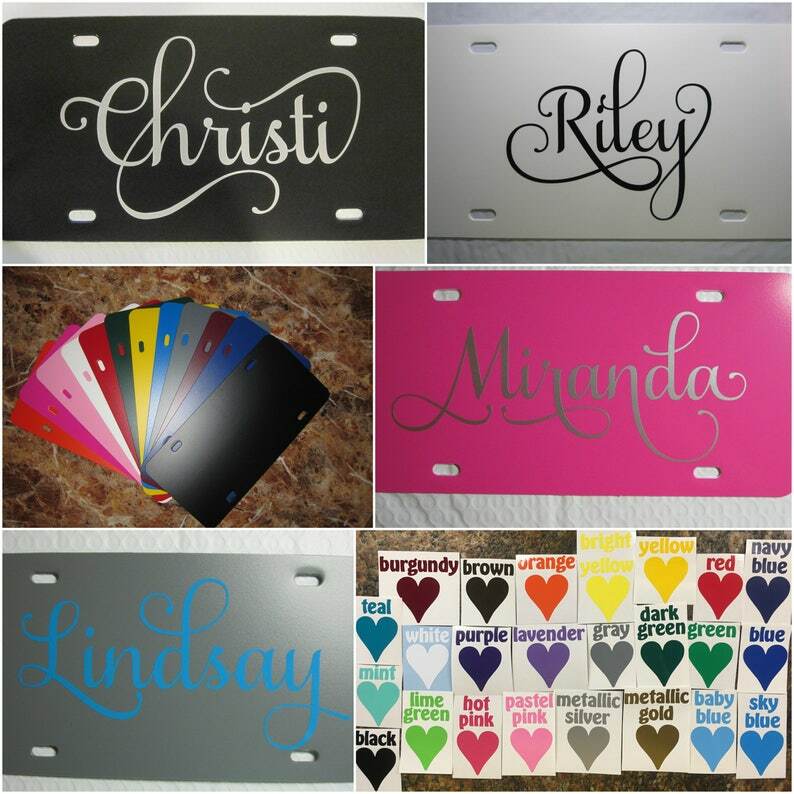 THIS LISTING IS NOT FOR A MONOGRAM.........go to my shop and click on the License Plate section to view my monogram license plates. This listing is for one name ONLY on the license plate. 3) Leave a note with the ONE name you want on the license plate, ONE name ONLY. Actual colors may vary by computer monitor settings. ~I do combine shipping for multiple purchases. You must click Add to Cart for each item to receive the discounted shipping rate. Not valid on past purchases. Not to be combined with any other offer/coupon. A great job, once I figured out the right combination of lettering vs background color. The personalized plate was done quickly and looks great! Do you offer a discount on multiple purchases? I run Sales from time to time that will allow you a discount on a minimum purchase amount. If I am not running a Sale in my shop and you need bulk pricing, a minimum of 25 decals (depending on color, size, etc) is required and you must contact me PRIOR to purchasing. All listings state the size, either in the "Item Description" or you choose the size from the drop down menu. I provide the size and it is up to you to make sure it is the size that will work on the item you are applying it to. I recommend measuring to get the fit and alignment you like best since everybody's preference varies. If you need a different size other than what is listed you can send me a convo. Personalized items do not require you to have a "Custom Order/Request" to purchase. All you need to do is leave a note once you've added the item to your cart with the information stated in the "Item Description" on the listing. If you are purchasing more than one item from my shop, click ADD TO CART, this will combine shipping and you will pay only one shipping rate no matter how many items you purchase from me. If you pay for each item on a separate transaction, you will be charged shipping for each transaction. So to get combined shipping you must add each item to your cart before completing your transaction.